Using an FDA approved contrasting agent containing tiny gas-filled microbubbles, coupled with a noninvasive ultrasound device that targets precise locations of the brain, a team of neurobiologists showed that repeated treatments temporarily opened the blood-brain barrier while causing no structural or functional damage. Researchers used a noninvasive, focused ultrasound device to temporarily disrupt the blood-brain barrier and target discrete regions of the brain. This approach may open the way for new drug delivery strategies for diseases such as brain cancers and Alzheimer’s, conditions typically not amenable to more conventional treatments. Using an FDA approved contrasting agent containing tiny gas-filled microbubbles, coupled with an ultrasound platform that targeted precise locations in the brains of nonhuman primates, researchers from Harvard Medical School showed that repeated treatments temporarily opened the blood-brain barrier while causing no structural or functional damage. Their results, which were published online in the journal Cancer Research, support clinical testing of this new application. 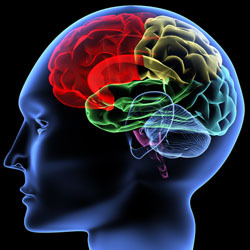 The brain is protected from most toxins and bacterial infections by the blood-brain barrier (BBB), a physical separation between the brain and the circulatory system which normally only permits small, essential molecules like oxygen and glucose through. Large molecules like chemotherapy agents and antibiotics cannot easily permeate the BBB, making it one of the primary obstacles for treating diseases of the brain. To address this problem, Nathan McDannold, HMS associate professor of radiology at the Brigham and Women’s Hospital and first author on the paper, and Margaret Livingstone, HMS professor of neurobiology, introduced a microbubble contrast agent into the circulatory system of nonhuman primates. Guided by an MRI, they then targeted specific areas of the brain with a device comprised of an array of 1,024 directed ultrasound transmitters, using short bursts at low power. Due most likely to the mechanical stimulation of microbubbles by ultrasound frequencies, the BBB weakened at targeted areas enough for the normally impermeable imaging dye to penetrate the brain. This effect lasts for roughly four hours, and is disruptive enough for drugs and large molecules to enter the brain and target, say, tumors. The researchers also verified the safety of this method. After multiple sessions of repeated disruptions of the BBB in the visual cortex and the central visual field, the animals performed a series of visual discrimination tasks that included learning and recognizing different symbols, at varying sizes, for a reward. While further tests are needed to completely eliminate potential hazards, repeated treatments with the current system have shown no evidence of injury. This work was supported by award number RC2NS069413 from the National Institute of Neurological Disorders And Stroke. Be the first to comment on "Noninvasive Ultrasound Device Opens the Blood-Brain Barrier"